You can very clearly see the more densely populated areas such as London. Obviously, the maps don't align. In order to fix this, I ended up learning a lot more about map projections. 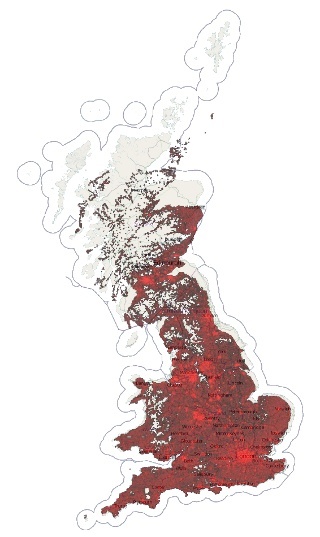 The Code-Point Open data uses the UK's National Grid to store location data in. 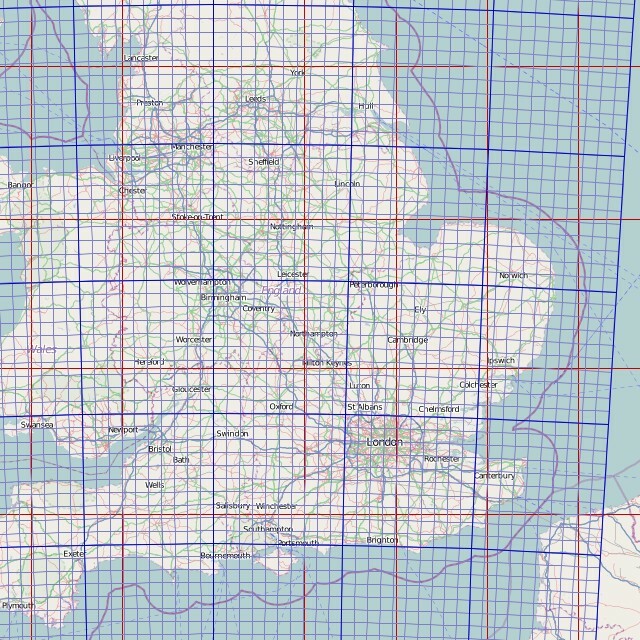 The National Grid consists of 100*100 km squares that are then further subdivided into smaller squares creating grid references such as TQ3012780512, or the numerical version 530128 180512. TQ translates into the "hundred thousands" of the Eastings and Northings according to the grid that you can see here. In this case, it specifies a point 530 128 meters East and 180 512 meters North of the origin. (If you work it out, you'll end up in London). 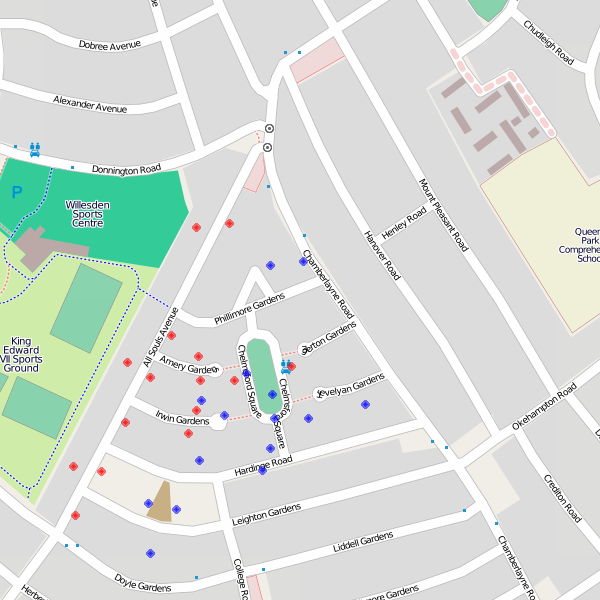 OpenStreetMap uses a Mercator projection to visualize maps. The Mercator projection is a cylindrical map projection, and it distorts the size and shape of large objects, as the scale increases from the Equator to the poles. Therefore it only works from about 85°N to 85°S (why it is 85° only be came clear after doing all the maths for it). Google Maps uses the same projection. 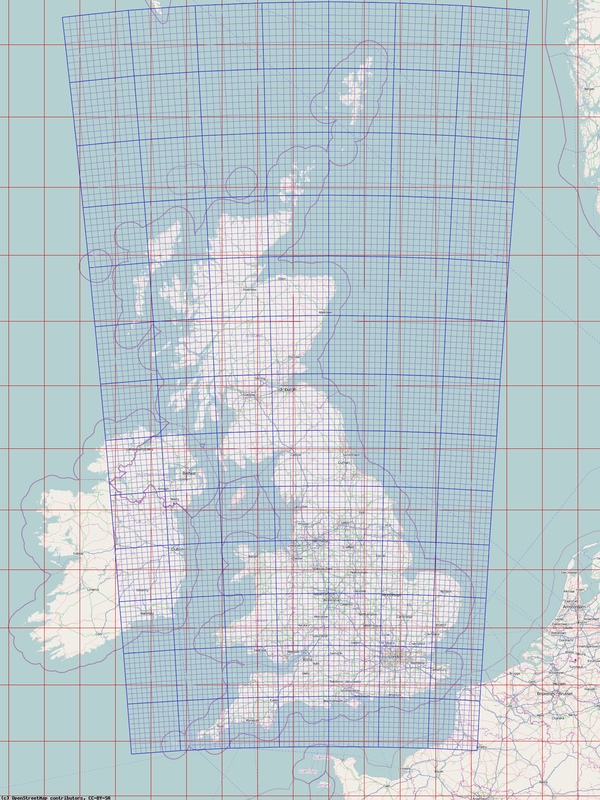 Latitude/Longitude pairs need to be mapped to pixels to align with the Mercator projection of OpenStreetMap maps. For a Longitude of 0.003117° E at zoom-level 13 that turns out to be pixel 1048594. For a Latitude of 51.502817° N at zoom-level 13 that turns out to be pixel 697399. The reason for this is that when we converted the National Grid locations to Latitude/Longitude pairs to plot on the OSM maps, I forgot to take into account the different Datums that are used in the projections. The Earth is not a perfect sphere, and an approximation of the ellipsoid of the whole Earth is not necessarily the best fitting for a specific area such as the UK. 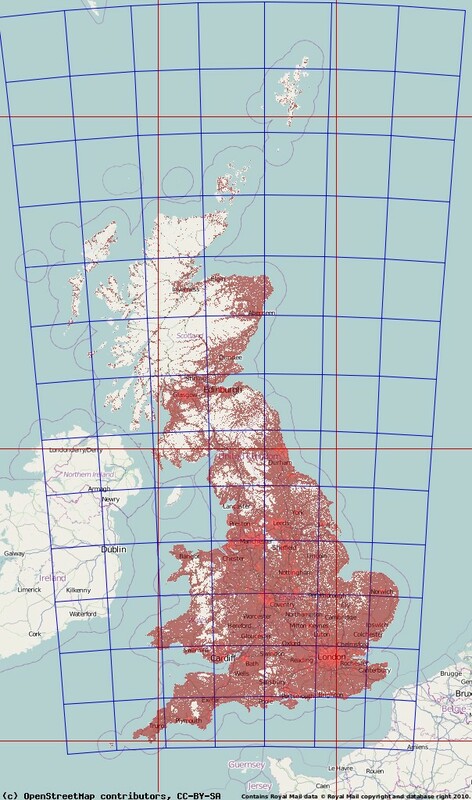 Therefore, the National Grid uses the OSGB36 Datum which fits more closely to the UK, where as OpenStreetMap uses the WGS84 Datum that is also used by GPS. The Ordnance Survey Ireland has a more thorough explanation on their site. As you can see above, using the wrong Datum can mean locations can be off. In our example about 100 meters. Converting between different Datums is possible, albeit processor intensive. Funny, I used to live in a house located on that last map. Anyway, does the license allow for converting to lat/long and re-publishing? @Richard: That code is unfortunately GPL. I've similar code, slightly more extensive that I will put in an extension for optimum performance. The geek capital of NW10? Silicon Gardens? tee hee. Interestingly, the license seems to expressly permit adapting and publishing… so why not? Hmm might try and knock something together. I found this most interesting. If we assume that GPS will become more popular is there a case for a printed map projection based on Longitude and Latitude so people could use GPS co-ordinates on a paper map? ie rather like the established grid reference. The problem I guess is the "real" location will change over time against the Co-ordinate.